5 day BHPA Elementary Pilot courses! Equipment - We supply all paragliding equipment during your course. We recommend you buy your own equipment during your club pilot course so you get used to flying it under our guidance. We are retailers for all the major manufactures and offer an equipment voucher of £300 off the price of a new paraglider. Training begins low down and moves onto high solo flights as confidence and ability grow. Tandem flights are also used along with radio guidance from your instructors. You will soon be flying high! BHPA and APPI rating. Weather: Paragliding is very weather dependant, it needs to be dry and the wind beneath 15mph. 5 day Elementary pilot course. * £550 You can pay by the day for £110 per day. 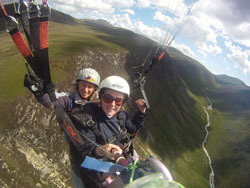 Paragliding Club - After you have qualified you are welcome to keep coming over and flying with us on Arran as you build up your confidence and airtime - We also put you in direct contact with a club from your local area. Flying Fever is a British Hang gliding and Paragliding Association (BHPA) and an International Association of Paraglider Pilots and Instructors (APPI) registered Paragliding school and has been teaching people to fly for over 25 years! We are based in Arran and run courses abroad. We have run courses from Hong Kong to Outer Mongolia and have spent a lot of winters teaching paragliding in Nepal in the Himalayas. We are planning a return trip this October 2018 to Turkey and a fly/ski 2019 trip to Spain in March 2019. Let us know if you want to join us. Try a fundays solo paragliding training or a Tandem flight with an instructor. Choose Funday or Tandem flight depending on what is best for the weather and flying site on the day. If you have a preference tell us when you book. The price includes BHPA membership. Weather: Paragliding is very weather dependent, it needs to be dry and the wind beneath 16mph. You book a day then phone the day before and again in the morning to check on weather conditions. We cancel if the weather looks unsuitable and reschedule for another day. You need patience and no refunds can be given. You can arrange to pay on the day instead of buying a voucher. These can be emailed when payment is received- contact us to make a bank transfer or use PayPal. 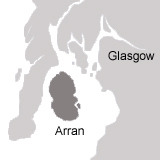 The Isle of Arran has over 30 flying sites taking all wind directions.